Should God Make My Decisions? How can we know God’s will? Does God desire to direct all our decisions, or let us make them for ourselves? Or something in between? Is there one and only one specific and distinct path that God has mapped out uniquely for each of our individual lives? I believe that God’s will for our lives is a lot broader than that, encompassing multiple alternatives within His moral boundaries. Expecting to perceive God’s will as a specific choice between good options in all our decisions is inconsistent, arbitrary and impractical. In fact, impossible. Christians often try to give God the responsibility for our own decisions as though they were His. Closely related is the thinking that “God’s will for me is one path and one path only. The exact career path, living locations, “the one” life partner. Any deviation from that one thread of decision-making is living out of His will.” So the thinking goes. In contrast, I believe God delights in giving us freedom to choose our path within a broad range of options that are within His already-revealed will. His Word gives broad principles of how we should prioritise the kingdom of heaven in our lives. Only rarely does God specifically tell us who to marry. Hosea and Gomer spring to mind as an example. Or where to live. Enter Abraham. Or what career to pursue: Jonah. I believe these are special cases. Exceptions, not the rule. And even then, they do not provide a basis for the manner in which Christians today tend to approach finding God’s will to aid their decision-making much like fortune-telling. In none of these cases do we find the human praying to God that He would reveal His choice in these specific matters. God simply came and unambiguously gave an unexpected life-changing plan. However, we want to avoid the hard work, risk and responsibility involved in constantly prioritising among good options for major life decisions. We want God to do more than simply tell us what is good and or bad. We want Him to tell us which specific option is best. Wouldn’t that make life much easier? I say this looking in the mirror. To be consistent, though, we would probably need to take this ‘fortune-teller’ approach to all decisions, not just the major ones. For example, whether to drive in the left or right lane down the freeway. We usually make such small decisions thinking little of it. But the potential consequences of a lane-changing decision can be just as life-changing as any major life decision. There’s some very practical and also some deep ideological problems with wanting to outsource responsibility for all the ‘major’ decisions of our lives to a ‘fortune-teller’ God. God created us to be free persons, with the ability to creatively express ourselves. To be independent. To love. Love is only possible for one who has freedom to choose. Otherwise we are merely robots. In a good marriage, both spouses try to please each other. But imagine if a wife tried to please her husband by asking him which job he wanted her to take, which clothes he wanted her to buy and wear, and made every decision according to his desires. One of them would soon become unhappy. The wife would tire of the husband’s overbearing control. Or the husband would tire of his wife’s inability to figure things out for herself. Or both. Yet sometimes we treat our relationship with God like that. Do we want Him to make all our major decisions out of desire for a mutually satisfying loving relationship based on freedom? I suspect that’s hardly our motivation for effectively treating God like a fortune-teller. My motivations have been selfish when I’ve fallen into that trap. The marriage analogy suggests that mutually loving relationships are optimised when there is freedom of choice – freedom of creative expression – within rather broad boundaries. A parent-child analogy is also useful as we are also God’s children. If the parent makes every decision for the child, the relationship will soon become dysfunctional and the child will not learn or grow. In reality, God gives us broad principles of right and wrong and gives us freedom to exercise our creativity and choice. Isn’t that what we’d prefer for our kids? Can you imagine wanting your kids to just ask you to direct all their career and life choices? Yet that’s effectively what we expect God to do for us. Wouldn’t you prefer your growing children to express their own unique identity and make decisions for themselves? The problem with the fortune-teller approach is that God’s Word doesn’t work like that. It gives us principles on which to grow in making our own sound decisions rather than a recipe for discerning God’s choice as if we were reading tarot cards or astrology. There are also many practical problems with the belief that God led you to a particular past decision that you made, or direction that you chose. At first everything seems to confirm that “God” wants you in New York. You get the job, your spouse also gets a transfer there. The kids find an excellent school. Everything is going swimmingly. Then the company that employed you winds up. Your wife falls pregnant again so soon neither of you will be working. The kids’ school ends up becoming a negative influence on the kids due to bullying and other problems. What do you do? “God” led you to New York, right? To take this approach consistently, you would really have to stay following a particular direction until you received a new or different direction. How would you apply that approach to choosing which lane to drive in on a motorway? A lane change might be needed more quickly to avert disaster than you have time to even formulate a prayer to your fortune-telling “God”. And if you felt that God chose a particular school for your children, would you be free to move them if they were bullied or abused at that school? Would you interpret any adversity as a new “direction” from God? Or maybe God is testing your faith? How do you know? There are always going to be exceptional circumstances or permutations of events that your original “directed” decision doesn’t cover. So the only way for “God”-directed decision making (fortune-teller style) to work effectively is for God to direct literally every decision, no matter how big or small. Plus all revisiting and revision of every decision. A whole new set of problems would be introduced, however, when our outsourced decisions involved the lives of other people who may or may not share the same view of “God’s direction” in every particular life choice. Andrew may think that God has directed him to marry Sarah and tells her so. But Sarah believes her prayers are leading her to a relationship with Harry. Beth and Bill marry, believing God directed them to join their lives. They share their story with their friends Dave and Amy who didn’t perceive any particular divine direction for their marriage. Amy begins to question her choice to marry Dave. Their marriage begins to falter because she thinks there must have been someone else God had in mind for her other than Dave. Back to Beth and Bill. Some years down the track, Bill abandons his faith in God and begins to have affairs, abuse Beth and threaten the kids. Is Beth obligated to stay in the marriage because “God” directed them to marry? What a mess! Surely there’s a better way. Then there’s a whole different set of decisions that are required in an urgent timeframe. Like whether to put your hand out to stop your child from running out onto a busy road. Should such decisions also wait for a clearly visible direction from “God” that applied to that particular circumstance? Another example of this type of decision is when someone asks us to do something. We feel as though we have to take the decision away and pray about it before we can accept the offer. That may well be appropriate. But why isn’t it also possible that you already know whether you will say yes or no to being asked to preach, pray, or be an elder? Your answer can be just as “spiritual” if it is given straight away, as you ideally have already communed daily with God about the gospel commission and its call on you to serve (2 Tim 4:2). Why do we feel that we need a clear direction from God when asked to serve in any role or activity that will last for a year or more, or be in front of a hundred people or more, for at least half an hour. But we most likely never think like that before opening our mouth to make a comment in a small group Bible study. Clearly, expecting to perceive “God’s direction” specifically for all “major” life decisions is inconsistent, arbitrary, impractical and even impossible. According to God’s Word, we have freedom to choose a variety of options within the broad range of His will (1 Cor 10:31). There are underlying principles that define the boundaries of options that are inside and outside of His will (e.g., see 1 Thes 4:3). These are clearly evident in His word, starting with the Ten Commandments (Ps 40:8). Does God ever lead through providential circumstances or serendipitous answers to prayer? I believe He does. Often. I have experienced this. But in my experience He has done this more often for instantaneous opportunities to share His love that only make sense in retrospect. Or to confirm decisions that we have already made ourselves using the principles and tools He has given us. It’s as if God says: “Good choice, Daniel. You understand My values and I will bless your decision so long as you keep trusting in Me.” It’s important to clarify, however, that had I made another decision within the broad boundaries of His kingdom’s principles, He could also have confirmed that alternative choice. Who’s in Control – God or Me? We should be always in submission to God’s indwelling Spirit – daily surrendered to His will. But we still take responsibility for our decisions. His ‘control’ does not make us robots. It is not a coercive control. It does not remove our independent freewill and creative choice. It protects us from the evil motives and selfish desires that would otherwise be in control. The important thing is to live a life of continual communion with God – in prayer and study of His Word. Continually making the small decisions in harmony with the values of the kingdom of heaven. It is in this sense that we should be willing “slaves” to His will. And constantly seeking to know it. Though not as robots! Or fortune-teller clients. Living like this will result in us also making optimal decisions in the big things. Think twice before praying: “God, I’ll marry the first person who speaks to me.” Such a prayer is foolish. It doesn’t make what happens next “God’s will” just because you put your fortune-telling “God” in a corner. There are still multiple careers, living locations, and marriage choices that God can bless. Yes, still bring those decisions to God. But ask for wisdom (James 1:5). Ask daily for a deeper love for, and understanding of, His values and character, so that you can intelligently become more like Him (Ps 119:34, Jn 17:3). Not merely a robot or a fortune-teller’s client. 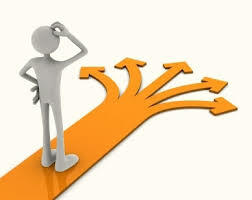 Does God ever direct particular choices for an individual’s specific life decisions? Very occasionally, yes. If He does, it’s, usually unexpected and unambiguous (e.g., Paul’s Damascus Road experience, see Acts 9:6,15). If this happens to you, follow God’s specific calling on your life with all your heart and soul. If you do not discern a specific call on your particular life choices, it is not because you are any less spiritual. You can still live your life knowing you are within His will (Gal 1:4, Rom 12:2). Love the Lord your God with all your heart, soul and mind, and follow all the directions He’s given in His Word (Eccl 12:13, Matt 28:19,20, Rom 6:16,17). Should we depend more on ourselves for making decisions and spend less energy seeking to know God’s will? Absolutely not. Seeking knowledge of God’s will is more about understanding His character (Eph 1:17,18) and growing in wisdom, faith and love (Eph 3:17-19) than about getting arbitrary signs that point to option A or B. Thus a greater investment of energy is required when we realise that we make our decisions with wisdom from God rather than treating God as a fortune-teller. And yes, we should still give God the glory for His leading in our lives. For giving us wisdom, and growing our characters. But hesitate before you claim that God directed you to a particular choice as though He were a fortune-teller that could be commanded to give you an answer through a job interview or a flip of a coin. That will backfire on you and bring God’s name into disrepute. I want to come back to the “New York” example I gave above. That is the most plausible-sounding of all the examples that I’ve given under the category of “fortune-telling”. It may have raised some questions in your mind. I’ve done almost exactly the same in the past. Not about moving to New York, but about doing a PhD. I prayed that if I got accepted to do a PhD, I would take it as God’s will. When I got accepted, I told people that God led me to do the PhD. In hindsight, I don’t know whether doing the PhD really was God’s ideal for my life at that stage. But it’s done and it’s not a question worth answering as I can’t go back and change the past. What if you prayed “God, if I get accepted to be a drug mule I’ll take that as Your will that I should go to Indonesia.” In the highly likely event that you are accepted, should you really take it as God’s will just because you prayed that prayer? Should Usain Bolt assume it’s God’s will if He prays, “God, I’ll take it as Your will that I should be on the athletics team if I get accepted”? Of course he’ll get accepted. Whether joining the team would be God’s will for him or not is an entirely different question. A better approach is to study God’s revealed will through His Word (Ps 119:105). Seek advice from people of integrity (Prov 11:14). And ask God in prayer: “Please give me wisdom for this decision. If there is anything important that I’m missing, please open or close doors accordingly.” Then move forward in faith (James 1:5,6). Often doors will open or close suggesting an answer to your prayers. But there’s always the problem of not knowing whether an obstacle is God allowing your faith to be tested or God closing a door. Or whether an opportunity is God allowing you to be tempted or God opening a door. I believe often God simply does not intervene at all, beyond natural cause and effect, to allow us to mature and grow in our decision-making. Slowly we begin to realise the confusion created by treating God like a fortune-teller. Instead He is a loving Father who delights to give us wisdom and freedom to creatively express ourselves in living out our loving response to His goodness. This does not lead to decision-making independent from God, but to closer intimacy with our Heavenly Father as we realise the profound awesomeness of free will. This entry was posted in Practical Christianity by Daniel Livingston. Bookmark the permalink.